This elegant hotel is in Centro, only a five minute walk to Royal Chapel of Granada and the Madrasah of Granada. Facilities at the Las Nieves Hotel include meeting rooms, a 24 hour reception and a coffee bar. The hotel also offers a concierge, luggage storage and multilingual staff. Recreational facilities at the hotel include billiards. 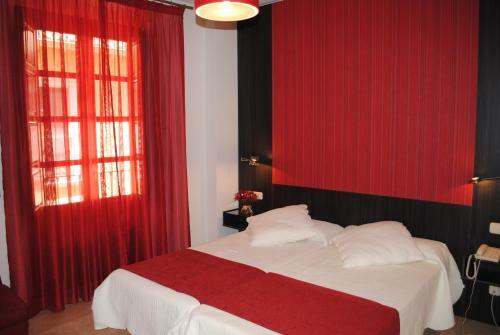 The Las Nieves Hotel offers comfortable and spacious rooms equipped with a hair dryer. Rooms also include internet access. Guests of the Las Nieves Hotel can enjoy a continental breakfast, which is served each morning. Room service is also available to guests during certain times. The hotel is a short walk from Granada Cathedral, and an easy drive from Monachil. Tours and other travel arrangements can be organized at the hotel's tour desk. This hotel is 1451 metres from the Alhambra entrance, 530 metres from Plaza Nueva (the absolute centre of Granada), 1541 metres from the train station and 3136 metres from the bus station.